In March 1919, Benito Mussolini founded the first "Italian Combat Leagues" (Fasci Italiani di Combattimento) at the beginning of the "two red years" (biennio rosso). He suffered a defeat in the election of November 1919 mainly due to Mussolini’s attempt to “out-socialist the socialists” at the ballot box. But, by the election of 1921, Mussolini entered the Parliament. Trade unions were dissolved while left-wing mayors resigned. The fascists, included on Giovanni Giolitti's "National Union" lists at the May 1921 elections, then won 36 seats. Mussolini then withdrew his support to Giolitti and attempted to work out a temporary truce with the socialists by signing a "Pacification Pack" in summer 1921. This provoked a conflict with the most fanatical part of the movement, the Squadristi and their leaders the Ras ("Dukes", from an Ethiopian term). In July 1921, Giolitti attempted without success to dissolve the squadristi. 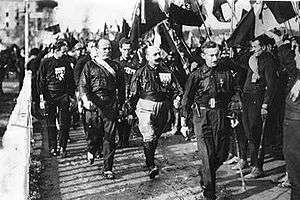 The contract with the socialists was then broken at its turn in November 1921, Mussolini adopted a nationalist program and founded the National Fascist Party, which boasted 700,000 members in July 1922. In August, an anti-fascist general strike was triggered, but failed to rally the Italian People's Party (Partito Popolare Italiano) and was repressed by the fascists. A few days before the march, Mussolini consulted with the U.S. Ambassador Richard Washburn Child about whether the U.S. government would object to Fascist participation in a future Italian government. Child encouraged him to go ahead. When Mussolini learned that Prime Minister Luigi Facta had given Gabriele d'Annunzio the mission to organize a large demonstration on 4 November 1922 to celebrate the national victory during the war, he decided on the March to accelerate the process and sidestep any possible competition.. 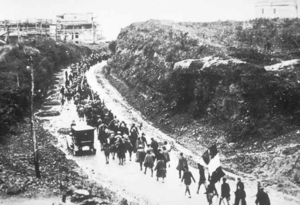 The march itself was composed of fewer than 30,000 men, but the king in part feared a civil war since the squadristi had already taken control of the Po plain and most of the country, while Fascism was no longer seen as a threat to the establishment. 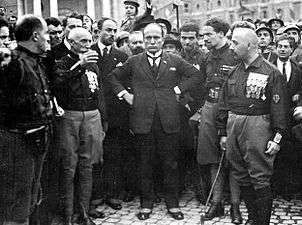 Mussolini was asked to form his cabinet on 29 October 1922, while some 25,000 Blackshirts were parading in Rome. Mussolini thus legally reached power, in accordance with the Statuto Albertino, the Italian Constitution. The March on Rome was not the seizure of power which Fascism later celebrated but rather the precipitating force behind a transfer of power within the framework of the constitution. This transition was made possible by the surrender of public authorities in the face of fascist intimidation. Many business and financial leaders believed it would be possible to manipulate Mussolini, whose early speeches and policies emphasized free market and laissez faire economics. This proved overly optimistic, as Mussolini's corporatist view stressed total state power over businesses as much as over individuals, via governing industry bodies ("corporations") controlled by the Fascist party, a model in which businesses retained the responsibilities of property, but few if any of the freedoms. By 1934 Mussolini claimed to have nationalized “three-fourths of the Italian economy, industrial and agricultural,” more than any other nation except the Soviet Union. Carsten, Francis Ludwig (1982). The Rise of Fascism. University of California Press.